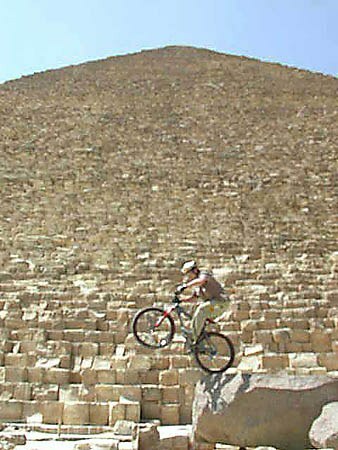 MORE, MORE >> Mysteries, theories and cover-ups about the Great Pyramid and surroundings! 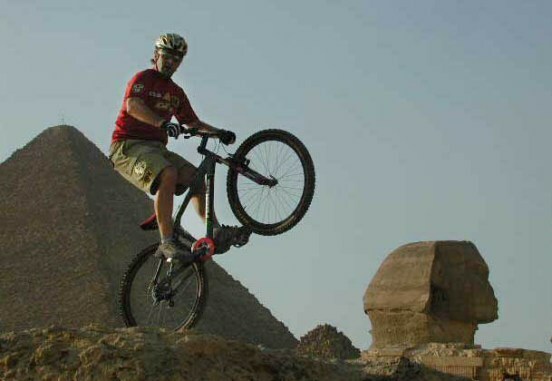 As you read this, we’re in the middle of the latest “Hans Rey Adventure Team” trip in Egypt. 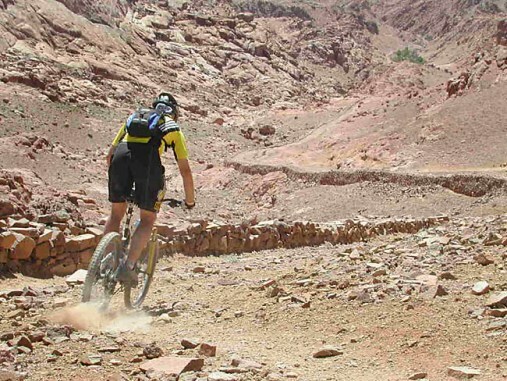 Besides taking a closer look at the ancient history and mysteries surrounding the pyramids and some of the other archeological sites, we are mainly here to cross the Sinai Peninsula on our mountain bikes. Along on the trip is action sports photographer Bill Freeman, as well as cinematographers Todd Lynch and Wade Fairley, shooting another one of American Adventure Production’s “Adventure Quest” TV show for the Outdoor Life (OLN) network. 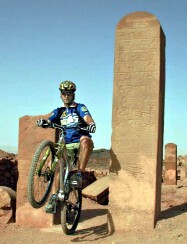 We hooked up with our local mountain bike guide, Ezzat, who will show us the hot spots. Today is the end of Day 3, we have spent all our time in and around Cairo getting ready for the real adventure across the Sinai Desert as well as exploring the ancient wonders nearby. With all the theories and speculations around the Great Pyramid in Giza, we wanted to find out first hand what’s true…and what’s not. Yesterday, I had the honor and rare chance to meet the worlds leading Egyptologist, Prof. Zahi Hawass, the director of the Giza Plateau. He is the final decision-maker regarding access to any of the archeological sites. He was around to stand question and answer. 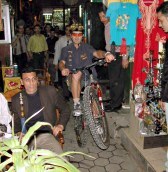 This man is super busy and the last thing he needs to do is waste his precious time with some bike rider, but he took his time and granted us excess to even some closed areas. Not that I expected to hear any well kept secrets, but after our talk and a tour with one of his assistance it was quite clear to me, that they must know much more than they publicly admit to. They also seemed quite surprised about some the things I had heard of and brought up in our conversation. 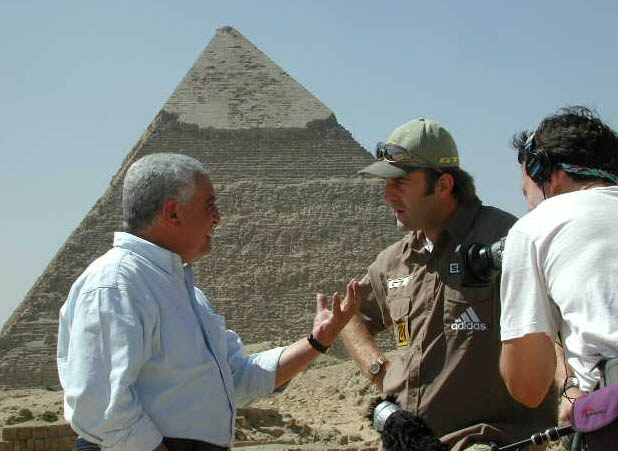 Although he had promised us that we would have the rare chance to go into the “Unfinished Chamber” deep inside the Great Pyramid, we later were told when we got there, that the only person with the key for that closed part of the pyramid was not around that day. 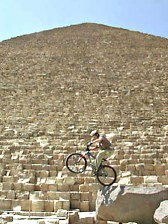 Anyway, I could go on forever, and will write more about all these mysteries later on my website; however, I kept bugging them and they promised to let me down there tomorrow – I have my doubts… But we got some great photo and film opportunities in and around the pyramids – which are mind-boggling and the most amazing thing I have ever seen. Another great experience was our visit to the local bazaar. It blows my mind how the bike can turn into such a great communication tool, and how a few front wheel and back wheel hops can change the way people look at you, but more important how they can make everybody very happy. 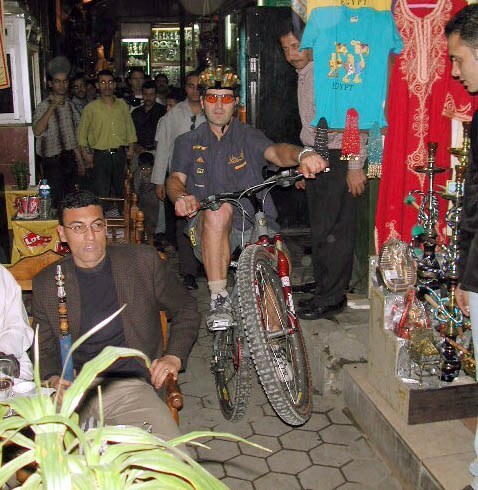 The atmosphere and energy at this bazaar was simply bizarre. 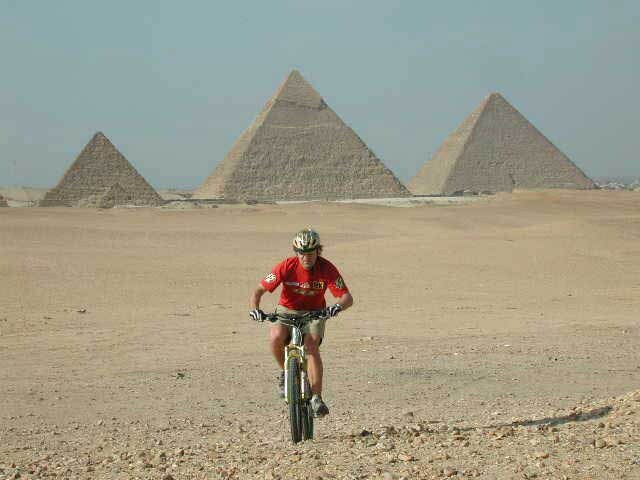 Today, our guide, took us for a cool mountain bike ride at the Oasis of Al-Fayoum; which is located about 60 miles southwest of Cairo. I will write you more in a few days, provided I can get online in some little village along the way in the Sinai desert. 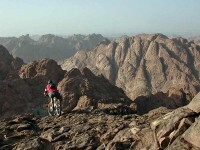 We spent the last 5 days riding through the Sinai Desert. 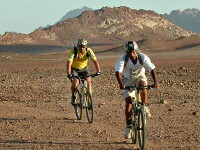 The Sinai Desert is unbelievable, although hot and dry, it has much to offer and the landscape changes constantly. One moment it looks like Utah, then you think you are in Joshua Tree, Baja, the Canary Islands somewhere in Greece or in the Sahara Desert. 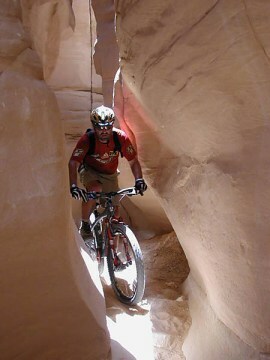 We have done all kinds of riding; from endless Jeep roads and wide open desert, to sandy stretches and really rocky and technical singletrails. The last couple of days we spent around Mount Sinai, where Moses supposedly received the 10 Commandments from god. I finished that day with a burley first descent from the very top (2285 meters or approx. 7000 feet above sea level). It’s been a few very hard days, but they were very rewarding and productive. computer is, and it’s almost impossible to explain one to them. We have about two days left, but the adventure’s still not over yet… I just found a way to e-mail, I hope it works, we’ll be back in civilization shortly. We made it! – We reached the “promised land” – after crossing the Sinai desert for over a week, following Moses’ ancient path. It turned out to be an awesome trip, with all kinds of challenges, terrains, and experiences along the way. Yesterday, we finished our last stage to the Red Sea; we ended the day with some breathtaking snorkeling at one of the best diving destinations in the world. 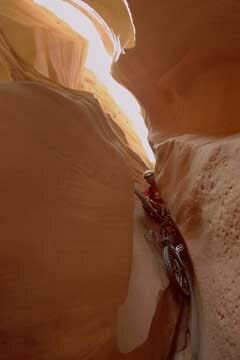 The last few days had some more great riding, including some incredible canyons. 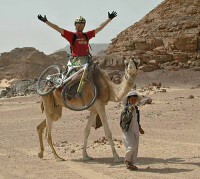 Although Ezzat advised us not to bring the bikes on this part of the trip, I couldn’t resist to bring it anyway. His warnings proved to be justified, at some sections I could hardly squeeze my body through the narrow cracks and I had to turn my stem to make the bike pass through. Nevertheless, most was ride/trialsable and the next people passing through this canyon will most likely be quite puzzled following my tire tracks. Overall it was a great adventure; I can’t wait to see the photos and the TV Show which will be aired on the Outdoor Life Network (Adventure Quest) later on this year. Life is sure tough in the harsh desert environment, I gained a lot of respect for all the Bedouins, who have to endure these conditions permanently. Nonetheless, they seem very happy and fulfilled just like us after shredding tons of great trails and making many new friends. Now, we’re getting ready for our departure from Cairo. We are back in the African part of Egypt, since the Sinai Peninsula is geographically located in Asia. We are still waiting to get to go inside the “Unfinished Chamber” in the Great Pyramid, so far we had to listen to many excuses, but I haven’t given up….. I’ll wait to send this e-mail until we get the final “no” or lame excuse from some Bureaucrat-Egyptologist. Who knows why they don’t want the public to see or know about many of their finds, but I’ll keep bugging them…..